The adage “Know what you do, do what you love” seems particularly appropriate for Freeman, a small Seattle-based company founded on a singular goal: design the perfect raincoat. From an ad hoc space in their own kitchen, husband/wife duo Scott and Brittany Freeman, well-versed in the rules of wet weather if not necessarily menswear design, did just that. And so, in 2010, armed with this raincoat, the seed for a company was planted. One jacket order for Scott’s brother turned into a handful of jacket orders for friends. Scott and Brittany moved operations from their apartment floor to the basement of their house. They chipped away and chipped away until, finally, they were more than just that first raincoat. 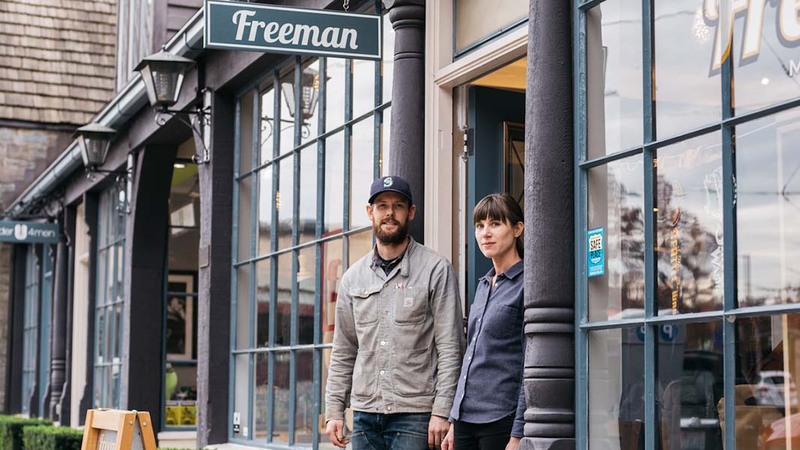 Today, Freeman lives on as a brick-and-mortar store that offers iterations of that foundational product as well as everything you could need in the face of foul weather. 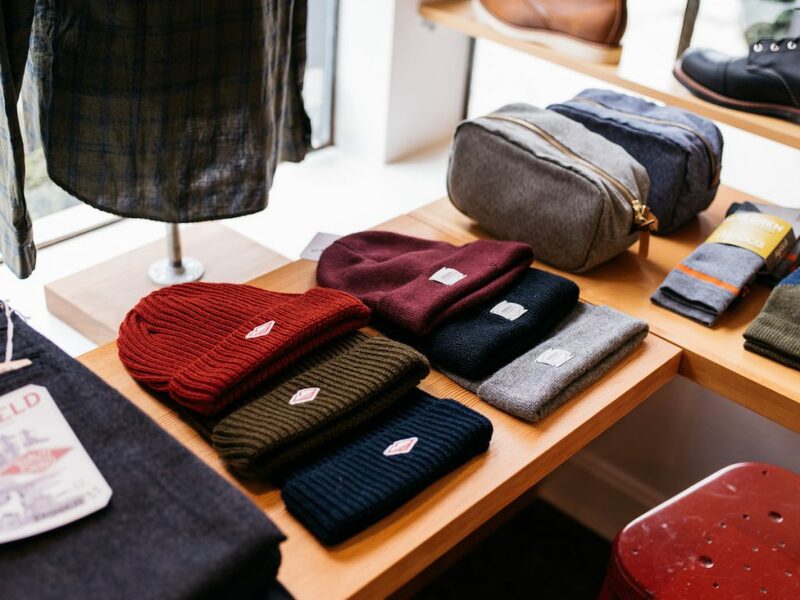 Freeman’s offerings run the gamut, with a robust catalogue of their eponymous line, as well as a curated selection that includes Left Field denim, Red Wing Heritage boots, and Upstate Stock gloves, among a handful of others. 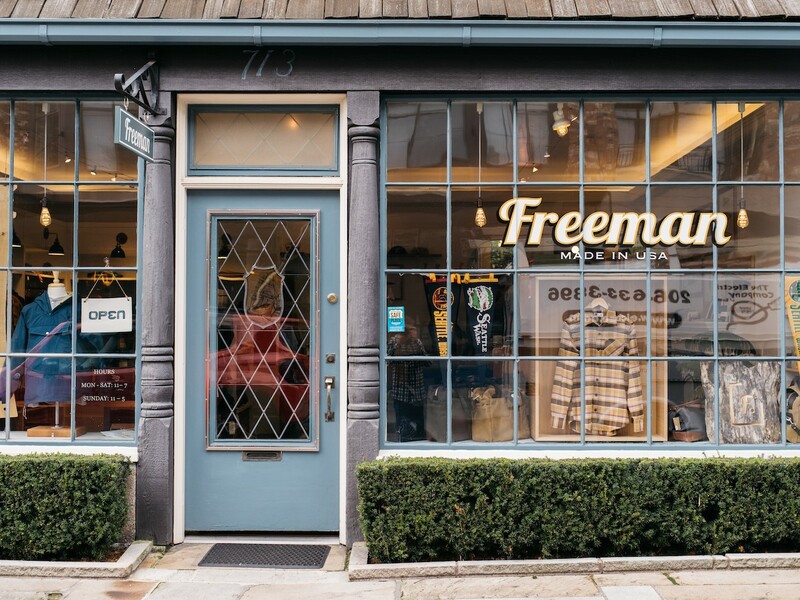 Freeman’s aesthetic—rugged, outdoorsy, utterly capable—is a product of its environment. These are goods for people who live in the nature that surrounds them. And for as functional as it all is, each piece looks great (and is made in America, to boot). What’s especially impressive is that the entire operation has been founded, funded, and operated by Scott and Brittany to this day. Below, we talk to Scott about important first orders, scaling the business, and what’s kept them moving forward all these years. BOND STREET: Do you remember the specific day/time that you decided to start the business? SCOTT FREEMAN: Getting down to the specific day/time for the genesis of things is a bit hard, but I pretty vividly remember standing in a store when on a rare trip to buy some new clothes and I thought to myself, “Are these really my options?” To be clear, this was not a big box store, either. I remember specifically deciding to hunt out better clothing and continued to run into dead ends. In light of these failed trips, our first project was to build a better shirt, but then as luck (or unluck) would have it, I tore a hole in my favorite raincoat. Since we had the sewing machine out and the apartment was already littered with fabric, we decided we would shift towards replacing that jacket. The jacket was an ‘80s or early-’90s era Berkeley-made North Face jacket that I had found used and it was the baseline for what we wanted to create. BOND STREET: What were you and Brittany doing prior to starting the company? SCOTT FREEMAN: Brittany worked for the ACLU of Washington in fundraising and I was/am a cabinet maker. BOND STREET: How did you prototype originally? What were the steps from getting the Freeman rain jacket from an idea to an actual thing? SCOTT FREEMAN: As I mentioned, it really started as a project to replace a torn raincoat. We had that original coat as our guide for some ideas about fit and overall look, but knew we wanted to tweak some things. It was a process with some rough edges, for sure. At its simplest, we would lay existing coats over paper and trace the sleeve shape to try and get a sense of them in two dimensions. We didn’t want to destroy anything we already had so we had to extrapolate how the pattern would be if we could unfold the sleeve. This process was used to get through a lot of the basic building blocks. We would get close and then mock up a body with sleeves out of scrap fabric to check fit. We started big and tailored the main body pieces down until it looked right, then we trimmed off the excess inside and pulled the pieces apart to see what we had when they were laying flat. I believe there were five or six revisions until we thought we had some basic pattern pieces we could work with. We were fortunate enough to have an outdoor fabrics retailer here, so waterproof fabrics were available by the yard, which is pretty rare. I have often said that this alone was fairly instrumental in our ability to do what we did. We bought some waterproof fabric and took the plunge with our pattern pieces. Fortunately, they worked. I still have the original result of this first project hanging in my closet. My brother saw the first jacket and wanted us to make him one, so we did. (Luckily we are twins so we could use the same pattern.) Then his roommate wanted one and we made him one. This was the trend for the better part of a year as we slowly churned out jackets from our rudimentary home-sewing setup. BOND STREET: How did you finance Freeman initially? How has that changed over time? SCOTT FREEMAN: Honestly, there wasn’t much to finance. We were working on the floor of our apartment and would just buy small amounts of fabric. We would charge just enough to cover the cost of fabrics, zippers, and trims and called it good. The biggest challenge came when we stepped into the world of production and decided to make 100 jackets so that we had an inventory onhand. Between finding and buying bulk fabrics and the cost of production, we had to figure out how we’d make that happen financially. Living in a tiny apartment and working full-time jobs left us with a few thousand in savings, which we liquidated. I wish it was still that easy, but as with most business trajectories, the amount’s grown beyond just being able to pull out some savings. The biggest challenge for us now is fabrics. We have everything made custom for us and with this comes much higher minimum yardage requirements which means more money upfront. Now we rely on credit lines like most folks. BOND STREET: You started the company in 2010 and opened a retail store in 2014. Prior to the physical location, were all of your sales eComm? SCOTT FREEMAN: While online sales were definitely a large part of our business prior to the store, we were actually doing quite a bit of wholesale between 2011 and 2014. We found ourselves going to tradeshows (which we didn’t know existed) and selling to stores in the U.S. and abroad. BOND STREET: Any breakthrough moments in the early days that were really important for the growth of the business? SCOTT FREEMAN: This one I remember pretty clearly. I was leaving a job site in my truck and I got an excited text from Brittany to call her, so I did. We had gotten our first big wholesale order from a Japanese retailer. This was the order that forced us to rethink how we finance materials and production so that we could actually fulfill the order. It was huge for us, not only in how we saw the viability of the raincoat broadly, but in how we would run our business when it came to finding money to make things happen. 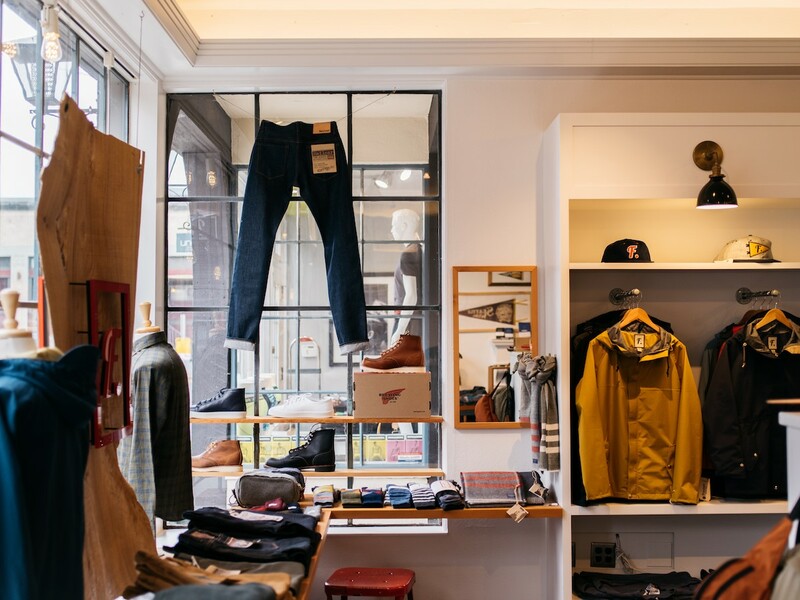 BOND STREET: How does creating clothing only made in America impact your business? SCOTT FREEMAN: Honestly, I think it makes it so much easier. There are something like 90 pieces that go into each jacket. Inevitably, we run out of labels or hanging loop or velcro, and, if that happens, I drive the ten minutes to the shop and drop off more. For a small business that is spread thin, I love this convenience. I think for our brick-and-mortar shop, the knowledge that much of the stuff in the shop (Freeman-brand items) are made 15 minutes away is a big selling point for many customers who might be on the fence about spending a little more that they are accustomed to. BOND STREET: What brands do you look up to and/or influence your work? SCOTT FREEMAN: Our foray into the world of tradeshows really broadened our knowledge of other brands and gave us a lot of respect for what other folks are doing. A big one for us is Crescent Down Works. Even though they are only minutes away from us in Seattle, it took us being in a trade show booth close to theirs in Las Vegas for us to actually meet–and we sure are glad we did. They have been doing small-scale, extremely high-quality production of down garments in Seattle since the ‘70s. They are the real deal. The folks at Juniper Ridge were also very instrumental in helping us realize and find our brand footing. They are great role models for how to approach a business and product. 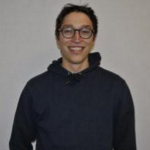 Rob, a Washington native, at Jungmaven has also given us so much support and insight, and we are extremely excited to continually carry his products at our store. BOND STREET: Do you have any advice you can share for other husband/wife teams considering starting a business together? SCOTT FREEMAN: Ride the wave. I always have said that you never quite know where this road might be headed. Life will give you cues and I think the best thing we ever did was heed them. It’s easy to be daunted by the challenges, but sometimes you need to reduce things to their simplest form and then you can build up from that. I think one of our biggest assets in this whole thing was coming into the process naive of what all lay ahead and having a vision only on making one thing. 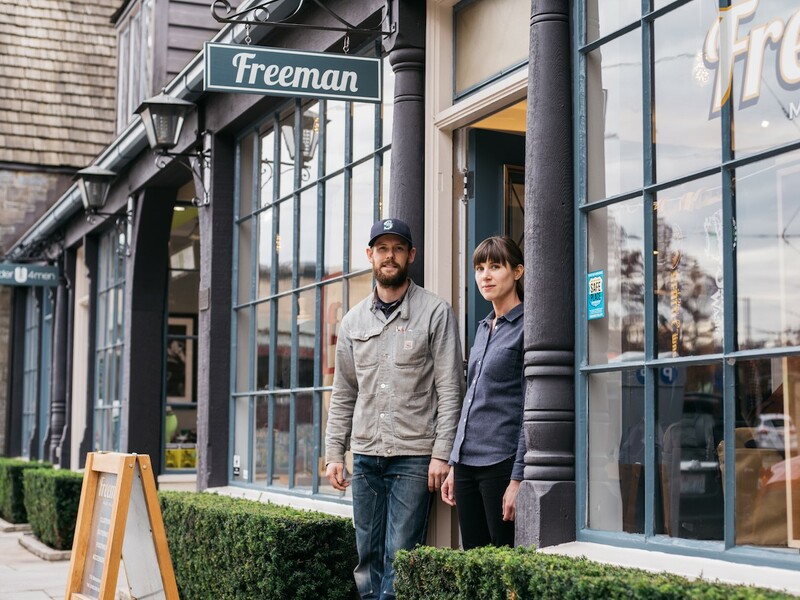 BOND STREET: What does Seattle, and more broadly the Pacific Northwest, mean to Freeman? SCOTT FREEMAN: This is always a funny one to me because being both from Seattle, Brittany and I were never really self-aware enough to realize the “raincoat makers from Seattle” concept. When we meet people their reaction often is that “Of course someone in Seattle would make a raincoat,” but we didn’t really think of that at first. Obviously though, it means a lot to us and not only informs how we run our business but I think, on a more subconscious level, informs that style of our brand/products. I spent most of my youth going to the mountains to snowboard and remembered what the functional difference between water-resistant and waterproof meant firsthand. This had a big impact on what we felt was important about the fabrics that we use in our coats. I think, while not uniquely a Northwest thing, the identity of many folks here is tied to the wilderness and outdoor activities that our in our backyard. BOND STREET: What has been the main driver of growth over the years? SCOTT FREEMAN: Can I say riding the wave again? To be honest, though, it’s true. Outside stimulus has been what forced us to grow. Even the decision to start the store can be traced back to us spending time as wholesalers, wishing we had more control over things. At this point, the store is the driver of growth as we have so much in-person contact with customers that we get new ideas about how to grow and how to approach things smarter. BOND STREET: Can you share some of the unexpected challenges you faced when moving into brick & mortar? SCOTT FREEMAN: I really feel like the years spent being a brand prepared us pretty well for jumping into the brick-and-mortar world. Everything from what other brands to stock to quantities [to have] was honestly pretty straightforward. The biggest challenges were found in those boring areas like financing and commercial rental agreements. Since I am a cabinet maker, the buildout was easy because I did it. It was probably my favorite part, actually. BOND STREET: Do you have a long-term vision for Freeman? Where do you see the business in five or ten years? SCOTT FREEMAN: I think we’d like to open a second store eventually and, regarding production, we would like to get back to being more involved in the nitty gritty. Our sewing contractor here is great and we’ve worked with them for many years, but I think having a bit more control of that side of things could really open up some more possibilities for customization that we’ve had to forgo in favor or producing higher quantities. Hmmm. To stay on the theme of “riding the wave,” I’d say just about anything by Hemingway is a pretty solid read for living vicariously through someone who knows how to take the cues from life and to roll with them. 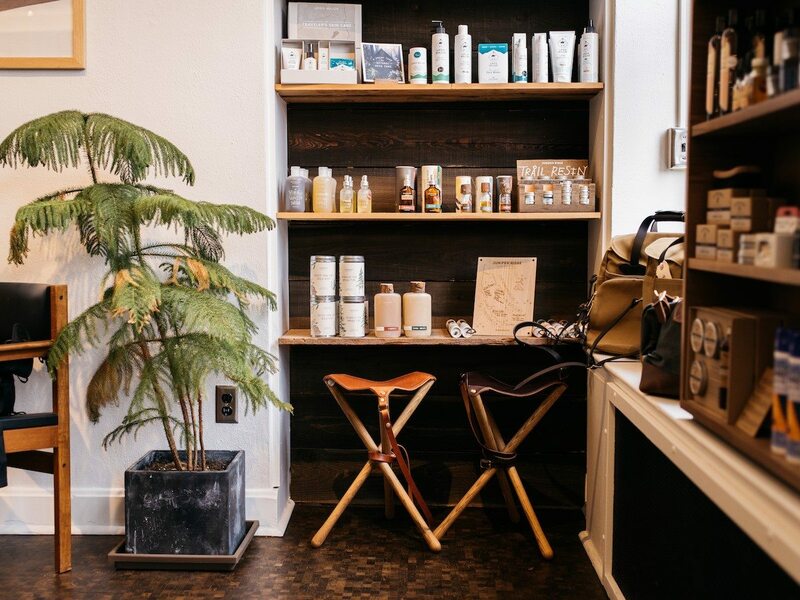 What are your 3 favorite independent businesses in Seattle? Independent business = healthy community. I think it’s that simple. Hiring In-House vs. Outsourcing: Which is Suitable for Your Business Growth?